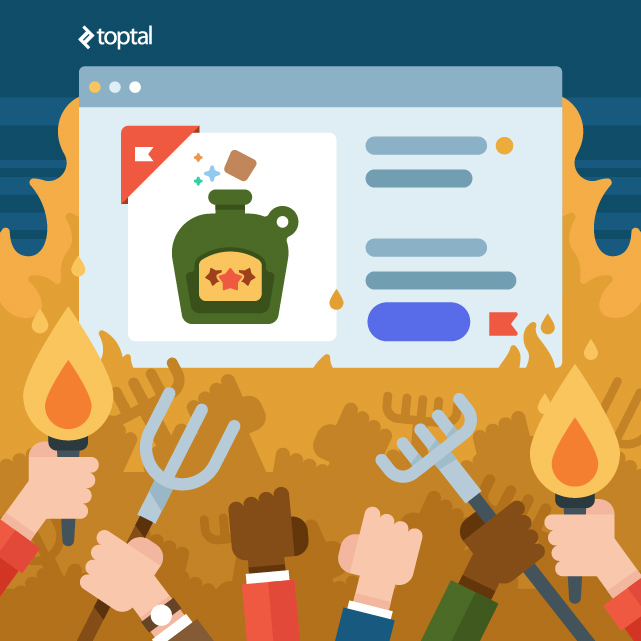 Disclaimer: This article was written, and published here as guest blog post,by Nermin Hajdarbegovic, a Toptal Technical Editor. It does not necessary reflect the views and opinions of the Networld team. The state of things as they actually exist. The place where bad crowdfunded ideas come to die. 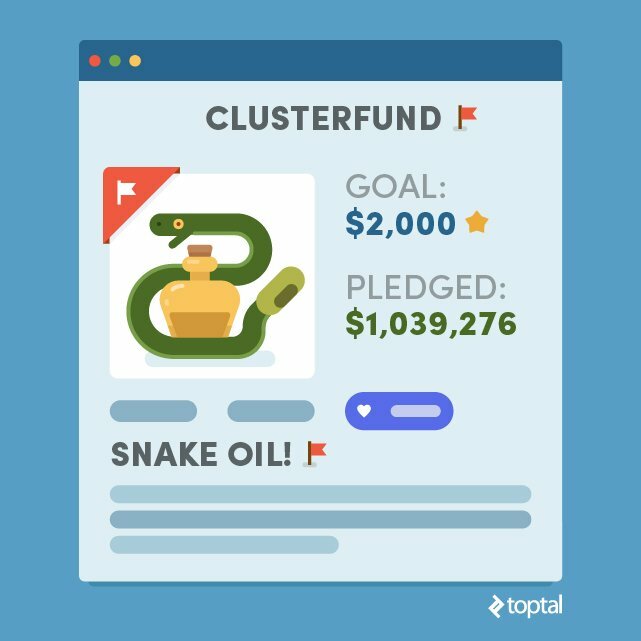 We are allowing snake oil peddlers to wreck the reputation of crowdfunding and the startup scene. Reputational risks extend to parties with no direct involvement in crowdfunding. By failing to clean up the crowdfunding scene, we are indirectly depriving legitimate ideas of access to funding and support. When crowdfunded projects crash and burn, the crowd can quickly turn into a mob. This is my argument: Entrepreneurs, developers, and enthusiasts have to be committed to weeding out bad apples in crowdfunding, for the greater good of our industry. But Wait, Crowdfunding Gave Us Great Tech Products! Indeed, but I am not here to talk about the good stuff, and here is why: For every Oculus Rift, there are literally hundreds of utterly asinine ideas vying for crowd-cash. Unfortunately, people tend to focus on positive examples and overlook everything else. The sad truth is that Oculus Rift is a bad example of crowdfunding, because it’s essentially an exception to the rule. The majority of crowdfunding drives don’t succeed. The press should be doing a better job. Major news organizations consistently fail to recognize impossible ideas, indicating they are incapable of professional, critical news coverage. Many are megaphones for anyone who walks through the door with clickbait. The press problem is made exponentially worse by social networks, which allow ideas to spread like wildfire. People think outlandish ideas are legitimate because they are covered by huge news outlets, so they share them, assuming the media fact-checked everything. Once it becomes obvious that a certain crowdfunding initiative is not going to succeed, crowdfunding platforms are supposed to pull the plug. Sadly, they are often slow to react. Crowdfunding platforms should properly screen campaigns. The industry needs a more effective regulatory framework and oversight. Realistic Expectations: Are You As Good As Oculus Rift? This is what I love about crowdfunding. Say you enjoyed some classic games on your NES or Commodore in the eighties. Fast forward three decades and some of these games have a cult following, but the market is too small to get publishers interested. Why not use crowdfunding to connect fans around the globe and launch a campaign to port classic games to new platforms? You can probably see where I’m going with this: Crowdfunding is a great way of tapping a broad community in all corners of the world, allowing niche products and services to get funded. It’s all about expanding niche markets, increasing the viability of projects with limited mainstream appeal. When you see a crowdfunding campaign promising to disrupt a mainstream market, that should be a red flag. Why? Because you don’t need crowdfunding if you have a truly awesome idea and business plan with a lot of mainstream market appeal. You simply need to reach out to a few potential investors and watch the money roll in. Most people are not familiar with the inner workings of software development, and can’t be blamed for not understanding the process. My examples should illustrate hype, and they’re entertaining. That’s why I’m focusing on two ridiculous campaigns: the Triton artificial gill and the Fontus self-filling water bottle. The Triton artificial gill is essentially a fantasy straight out of Bond movies. It’s supposed to allow humans to “breathe” underwater by harvesting oxygen from water. It supposedly accomplishes this using insanely efficient filters with “fine threads and holes, smaller than water molecules” and is powered by a “micro battery” that’s 30 times more powerful than standard batteries, and charges 1,000 times faster. Sci-Tech Red Flag: Hang on. If you have such battery technology, what the hell do you need crowdfunding for?! Samsung, Apple, Sony, Tesla, Toyota and just about everyone else would be lining up to buy it, turning you into a multibillionaire overnight. The necessary battery technology does not exist. The described “filter” is physically impossible to construct. The device would need to “filter” huge amounts of water to extract enough oxygen. Given all the outlandish claims, you’d expect this sort of idea to be exposed for what it is within days. Unfortunately, it was treated as a legitimate project by many media organizations. It spread to social media and eventually raised nearly $900,000 on Indiegogo in a matter of weeks. Luckily, they had to refund their backers. This idea doesn’t sound as bogus as the Triton, because it’s technically possible. Unfortunately, this is a very inefficient way of generating water. A lot of energy is needed to create the necessary temperature differential and cycle enough air to fill up a bottle of water. If you have a dehumidifier or AC unit in your home, you know something about this. Given the amount of energy needed to extract a sufficient amount of water from air, and the size of the Fontus, it might produce enough water to keep a hamster alive, but not a human. While this idea isn’t as obviously impossible as the Triton, I find it even worse, because it’s still alive and the Indiegogo campaign has already raised about $350,000. What I find even more disturbing is the fact that the campaign was covered by big and reputable news organizations, including Time, Huff Post, The Verge, Mashable, Engadget and so on. You know, the people who should be informing us. 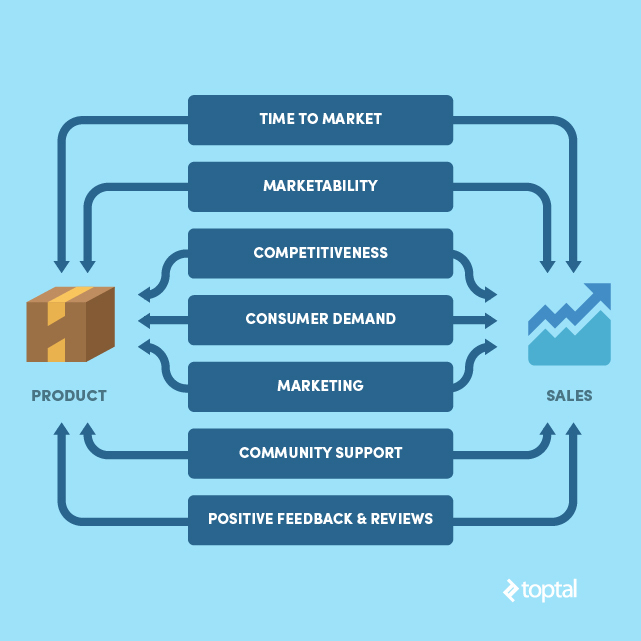 Just because something is technically possible, that doesn’t mean it’s practical and marketable! I have a strange feeling the people of California, Mexico, Israel, Saudi Arabia and every other hot, arid corner of the globe are not idiots, which is why they don’t get their water out of thin air. They employ other technologies to solve the problem. Mainstream Appeal Red Flag: If someone actually developed a technology that could extract water from air with such incredible efficiency, why on Earth would they need crowdfunding? I can’t even think of a commodity with more mainstream appeal than water. Governments around the globe would be keen to invest tens of billions in their solution, bringing abundant distilled water to billions of people with limited access to safe drinking water. NASA referred to the ill-fated Apollo 13 mission as a “successful failure” because it never executed a lunar landing, but managed to overcome near-catastrophic technical challenges and return the crew to Earth. The same could be said of some tech crowdfunding campaigns, like the Ouya Android gaming console,Ubuntu Edge smartphone, and the Kreyos Meteor smartwatch. These campaigns illustrate the difficulty of executing a software/hardware product launch in the real world. Ouya was envisioned as an inexpensive Android gaming device and media center for people who don’t need a gaming PC or flagship gaming console. Ubuntu Edge was supposed to be a smartphone-desktop hybrid device for Linux lovers. The Kreyos Meteor promised to bring advanced gesture and voice controls to smartwatches. What went wrong with these projects? Ouya designers used the latest available hardware, which sounded nice when they unveiled the concept, but was outdated by the time it was ready. Soft demand contributed to a lack of developer interest. The Ubuntu Edge was a weird, but good, idea. It managed to raise more than $12 million in a matter of weeks, but the goal was a staggering $32 million. Although quite a few Ubuntu gurus were interested, the campaign proved too ambitious. Like the Ouya, the device came at the wrong time: Smartphone evolution slowed down, competition heated up, prices tumbled. The Kreyos Meteor had an overly optimistic timetable, promising to deliver products just months after the funding closed. It was obviously rushed, and the final version suffered from severe software and hardware glitches. On top of that, demand for smartwatches in general proved to be weak. These examples should illustrate that even promising ideas run into insurmountable difficulties. They got plenty of attention and money, they were sound concepts, but they didn’t pan out. They were not scams, but they failed. Even industry leaders make missteps, so we cannot hold crowdfunded startups to a higher standard. Here’s the difference: If a new Microsoft technology turns out to be a dud, or if Samsung rolls out a subpar phone, these failures won’t take the company down with them. Big businesses can afford to take a hit and keep going. Failure in the tech industry is not uncommon. But, failure is a luxury most startups cannot afford. If they don’t get it right the first time around, it’s game over. Why Crowdfunding Fails: Fraud, Incompetence, Wishful Thinking? There is no single reason that would explain all crowdfunding failures, and I hope my examples demonstrate this. Some failures are obvious scams, and they confirm we need more regulation. Others are bad ideas backed by good marketing, while some are genuinely good ideas that may or may not succeed, just like any other product. Even sound ideas executed by good people can fail. The idea behind crowdfunding was to help people raise money for small projects. Crowdfunding platforms weren’t supposed to help entrepreneurs raise millions of dollars. Most Kickstarter campaigns never get fully funded, and successful ones usually don’t raise much money. One fifth of submitted campaigns are rejected by Kickstarter, while one in ten fully-funded campaigns never deliver on their promises. Even if all goes well, crowdfunded products still have to survive the ultimate test: The Market. Unfortunately, some crowdfunding platforms don’t appear eager to scrutinize dodgy campaigns before they raise heaps of money. This is another problem with crowdfunding today: Everyone wants a sweet slice of the crowdfunded pie, but nobody wants a single crumb of responsibility. That’s why I’m no optimist; I think we will keep seeing spectacular crowdfunding failures in the future. This admittedly corny joke illustrates another problem: On their own, ideas are worthless. However, ideas backed up by hard work, research, and a team of competent people are what keeps the industry going. Investors don’t care about your awesome idea and never will. Once you start executing your idea and get as far as you can on your own, people may take notice. Investors want to see dedication and confidence. They want to see prototypes, specs, business plans, research; not overproduced videos and promises. If an individual is unwilling or incapable of making the first steps on their own, if they can’t prove they believe in their vision and have the know-how to turn it into reality, then no amount of funding is going to help. Serious investors don’t just want to see what people hope to do; they want to see what they did before they approached them. Why not grant the same courtesy to crowdfunding backers?